Providing an ultra-luxe and secluded setting down the cliff from Agios Giorgios Church, the Elite Luxury Suites Santorini offers a sumptuous experience. Featuring a cliffside location down the hill from the Agios Giorgios Church, the chic property accepts guests age 12 and older. Offering just four villas, the exclusive retreats have Cycladic-style architecture, private pools, kitchens, and living areas with flat-screen TVs and satellite channels. Continue reading about each of the four villas below the photos. Featuring a pampering and romantic retreat, the Elite Suite is a 60 square meter (645 square feet) one bedroom cave house. The outdoor terrace has a private pool, there's a spacious living room with a full kitchen, and the intimate bedroom has a walk-in closet and two private bathrooms. Read more below the photo of the Elite Suite's master bedroom. Offering a tranquil setting for up to four people, the Premier Suite has 100 square meters (1,076 square feet) of space. There are two bedrooms, each with walk-in closets, king size beds, and private bathrooms. Plus, there's a living area with a full kitchen, and a private terrace with panoramic views and a private pool. Continue reading below the photo of the Premier Suite's kitchen. Built into a cliff, the Grand Suite is 130 square meters (1,399 square feet), and offers one master bedroom with two private bathrooms, two additional bedrooms each with their own bathroom, and walk-in closets in each room. The open-concept living room has a furnished kitchen, and there is a fully-equipped gym (shown below) within the suite. Capable of accommodating up to 6 people, there's a private terrace with a pool, as well as Caldera and Aegean Sea views. Continue reading below the photo of the Grand Suite's fitness room. Providing unrivalled views to the Caldera and Aegean Sea, the Presidential Suite is set within a tradtional Cycladic cave offering 140 square meters (1,507 square feet) of space. Within the suite there is a fully-equipped kitchen, spacious living room, private gym, and an outdoor terrace with a pool. Providing space for up to four people, the suite has a master bedroom with a king size bed and bathroom, plus an additional bedroom with a smaller private bath and walk-in closets. Read more below the photo of the Presidential Suite. Within walking distance of shops and attractions along the island's main road, the Elite Luxury Suites Santorini has four villas with modern styling, providing guests with a unique and private setting. With a breathtaking view of the world-famous Aegean caldera, the volcano and the deep blue waters of the Mediterranean Sea, the five-star Aigialos Hotel, strategically located at the most peaceful, romantic and relaxing district of Fira city, offers from all its balconies and verandas an unrivalled experience of the loveliest sunset in the world, together with a rare combination of unique architecture, elegance and tradition. Now that's a pretty spectacular breakfast view! 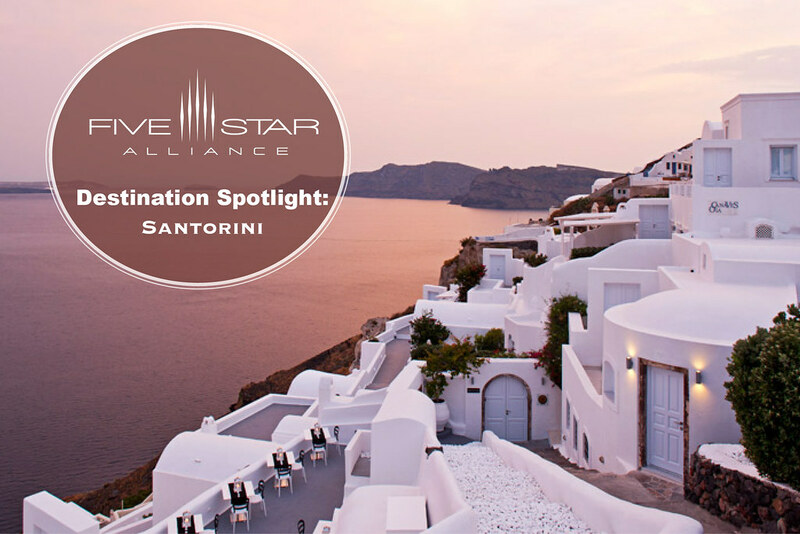 Iconic Santorini is a boutique hotel that features 20 individualized traditional cave residences, rooms, and suites. Guess can enjoy massages in the private couples rooms or sun themselves on the unusual black pebble or black sand beaches. At Pegasus Suites and Spa, guests can nourish their senses in their own infinity pool or simply unwind watching the sunset from their private terrace. Guests of Aigialos Hotel can enjoy a wide variety of inspired dishes, which combine local cuisine and ingredients, with contemporary Mediterranean recipes, especially prepared by the Chef Konstantina Faklari. From mouthwatering main courses to heavenly deserts and delightful frozen cocktails, the Aigialos exclusive restaurant reflects the best gastronomic tradition of Santorini. Meet the newest member of the Five Star Alliance collection, Pegasus Suites and Spa. Set amphitheatrically over the cliffs and following the particular architecture of the island, the hotel blends in completely with the uniqueness of the scenery, preserving the caves, the volcanic rocks, and the white and blue colors of the Aegean without sacrificing its modern style. The Suites have been constructed and decorated according to the Cycladic architecture and they offer to their guests comfort, luxury, a pleasant mood, romantic atmosphere, and of course an unforgettable stay.